Little Home on The Hill: Autumn falls. But totally uploaded with solar energy after a fantastic summer, here we are, back at blogland. You can see it, you can feel it...autumn is here. 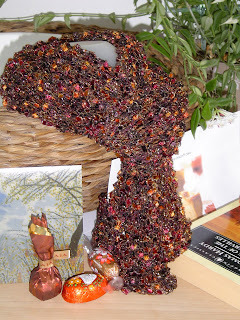 To celebrate this wonderful coloured season I participated at the Seasonal Celebrations Swap at InspiredMamaMusings. Tip: keep an eye on her blog for not missing the winter edition! So autumn is all about cocooning and cosyness and trying to handle the first chillyness. Hearing the wind outside and rain against the window, feet curled up on the sofa, accompanied by some good reading matter and hot chocolate. Soft and warm turtle necks and woolen scarfs... Making walks through the fields and forest and collecting autumn leaves. You'll recover these things in the package I composed for my swap partner. Tammy, I hope you liked it! Yes, that actually is a self-knitted scarf you see over there. My first attempt at knitting. With a little help of this knittingcourse. It is written in dutch but with clear pictures of the basic knitting stitches. Very useful for a knitting layperson as this one. And you, are you in the mood for fall? That is your first attempt at knitting? Good job! Looks cozy! I have just started knitting too, if my scarf looks anything like yours I will be a happy little bunny all snuggled up and ready for the winter :D Lovely blog you have here.